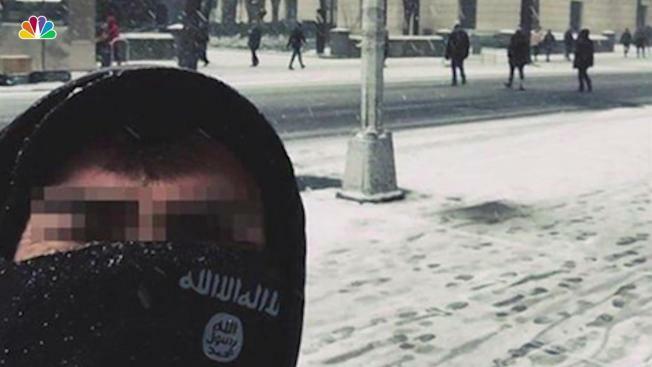 A photo of an apparent ISIS supporter posing in front of New York City's Metropolitan Museum of Art last Christmas was altered after being taken from an Italian tourist's social media posting, law enforcement officials said Thursday. FBI agents tracked the actual person seen in the photo to his native Italy and interviewed him. Officials said he was innocent and did in fact take that picture and post it on social media. But someone else later superimposed the ISIS symbols onto his scarf in an attempt to make an online terror threat to New York. Investigators had said they believed the ISIS supporter who altered the holiday season photo was based in Turkey. FBI agents and police tracked the man in the photo based on his social media postings as well as a credit card record showing he had in fact visited the Metropolitan Museum of Art along Fifth Avenue that December day. Intelligence officials said ISIS supporters are increasingly altering photos of regular people and using them to try to recruit followers and to make threats. FBI officials said there are no new specific, credible threats to New York. Law enforcement officials said Joint Terrorist Task Force officials have dozens of investigations underway in the New York area into possible extremists.